Okay, the singularity has arrived. My friend Sharon, an outstanding English teacher who has remained, to this point, a very traditional and non-technology-based instructor, just texted me from an ed conference she’s at, and she wants to try out this whole “flipped classroom” thing. She wants to know how to go about doing that. Let’s take care of some terminology first. A “hybrid classroom” or “blended classroom” (the terms are synonymous) is one in which, in addition to meeting in a physical classroom on a regular basis, some significant amount of the work for a course is conducted, or at least available, online. Watching/listening to a classroom lecture from the teacher. Watching/listening to the teacher in a pre-recorded podcast or video. You can read about people’s experiences with, and the ideas behind, hybrid or blended learning here, and here, and here. What’s a ‘flipped classroom,’ then? A flipped classroom is simply a type of hybrid classroom in which activities traditionally conducted in class are shifted to an out-of-class time, allowing for valuable face-to-face class time to be used for other work. Most commonly, this currently consists of teachers recording short videos of material that would have been presented in class, so that students can watch that presentation at home. The idea, then, is that students can do their “homework”—working on problems, asking questions of the teacher—in class, where the teacher is available to assist. Why Would I Want to Consider Changing What I Do? There are lots of reasons why you might want (or might not want) to change the way you look at how you teach. There’s no question that students find technology-mediated experiences more interesting, and teachers interested in exploring new possibilities tend to be enthusiastic about these ideas, which has a positive effect on their teaching. Many teachers, and I count myself among them, also feel that we should not only be teaching content, but process; having students learning to use technology is critical to preparing them for their future. Finally, and perhaps most importantly, teachers who have shifted to a flipped classroom model feel that that model actually allows them to make better use of the time they have with their students. Why have students work on their homework at home where the teacher is unavailable to answer any questions they might have? Why have students sit in class listening to a presentation when they can just as easily do that at home, on the computer? What are the Challenges Associated with Hybrid Classrooms and Flipped Learning? This isn’t meant to dissuade you from taking on the process, but for teachers who already occasionally feel overworked, it’s important to acknowledge this at the start. A good strategy is to make small, incremental changes, rather than trying to re-do your entire course at one time. See the follow-up post on one strategy that you can use. It may well be the case that not all of your students have access to a computer connected to the Internet, which is obviously going to have an effect on how a teacher or a school chooses to approach these strategies. Some schools already require technology experiences for students via a 1-to-1 or Bring Your Own Device program, some provide financial or hardware support for students-in-need, some teachers will provide non-technology-based alternatives, and some teachers/schools will restrict new learning strategies unless every student can be provided with the same experience. If you’re an evidence-based guy or gal (as I am), and you’re looking for data that suggests all of this improves learning or test scores, I’m afraid that the jury is still out on that. …Analysts noted that these blended conditions often included additional learning time and instructional elements not received by students in control conditions. This finding suggests that the positive effects associated with blended learning should not be attributed to the media, per se. An unexpected finding was the small number of rigorous published studies contrasting online and face-to-face learning conditions for K–12 students. In light of this small corpus, caution is required in generalizing to the K–12 population because the results are derived for the most part from studies in other settings (e.g., medical training, higher education). This doesn’t mean that a flipped classroom isn’t worthy of exploration. On the contrary, interested and enthusiastic teachers are encouraged to consider new ways of looking at how they teach, and implementing new instructional strategies that they feel might be of benefit to their students. Okay. So how do I get started? If it turns out that you’re interested in taking some steps towards making your course more hybrid, and in particular you’d like to play around with the idea of flipping your class a bit, the next post will give you one possible path. 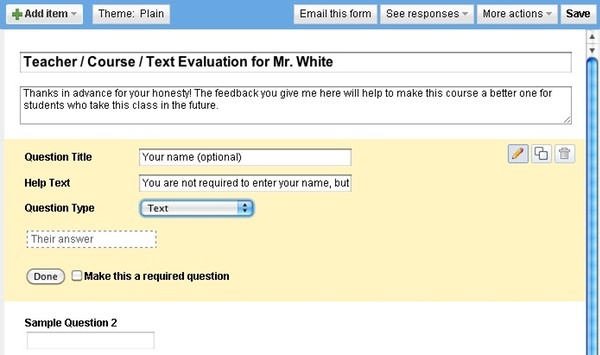 In addition to teaching—interacting with our students in one way or another to guide them in learning new material—most of us find ourselves in the position of collecting various forms of data on our students: attendance, essay responses to questions, test scores, evaluations of their projects, etc. There are two sets of data that I collect from year to year that have been especially helpful to me. One is a “Student Information Form.” Students at the beginning of the year are asked to give me the usual name, address, phone number, email address, along with contact information for their parents/guardians, the students screen name (if they chat), their favorite musical artists (interesting to me), and anything else they’d like to mention to me at the beginning of the school year. In the good old days I’d collect that information on a piece of paper with purple text, smelling of chemicals and still slightly damp from the ditto machine. Then the school got a photocopier. 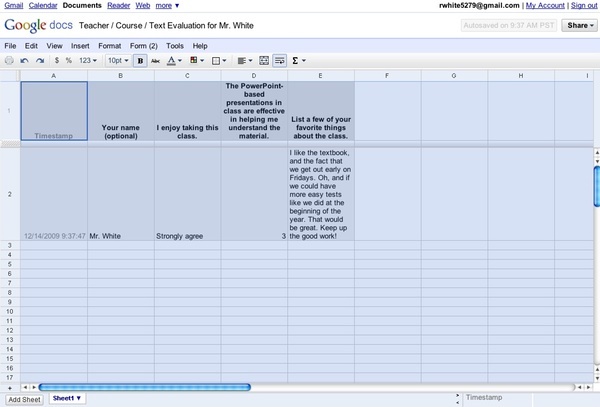 A few years ago I set up an online form that students would fill out, with the results of the form emailed to me so that I could easily process and compile them into a spreadsheet. 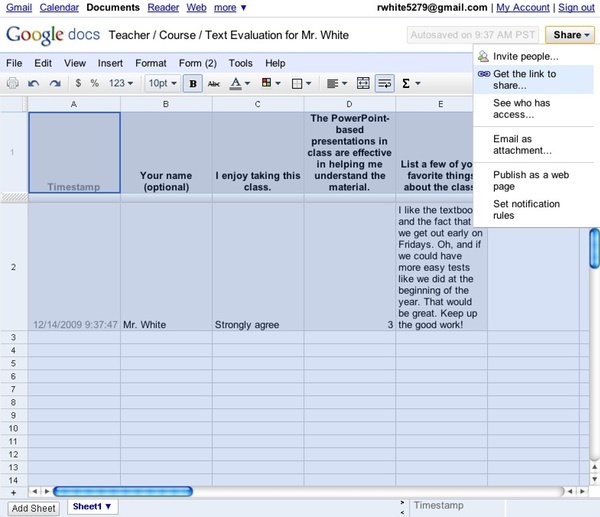 Enter Google Docs, and the outstanding Forms option. 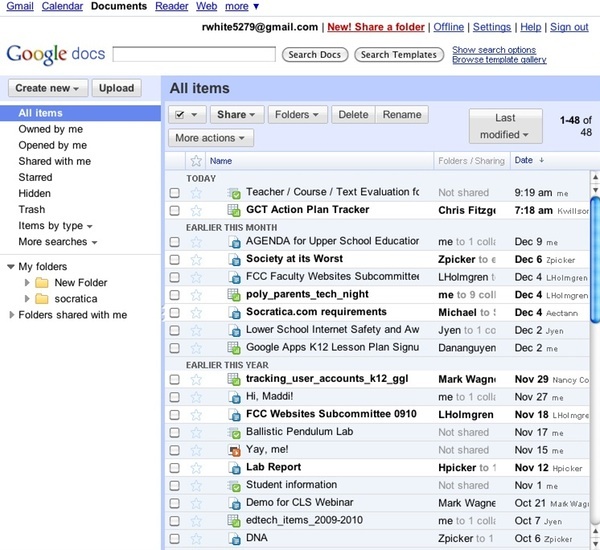 Now, with a Google account and Docs, you can have Google do the heavy lifting for you. For this example, I’m going to use another type of form that I use to collect information from my students, but this time, it’s information on me. 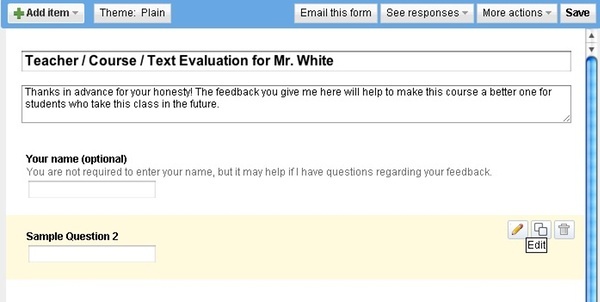 A teacher/course/text evaluation is something I’ve used over the years to track my own teaching, and get ideas from students on how I can improve things. 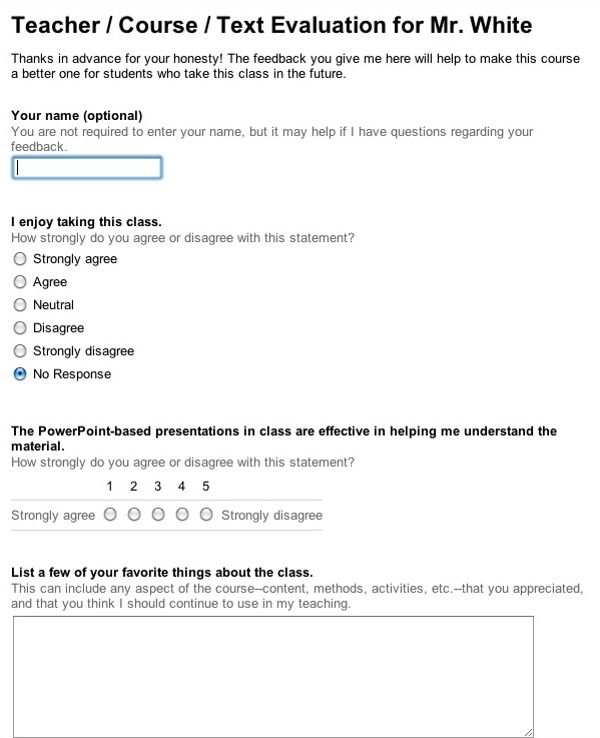 I’ve got a series of questions that I ask students to give me feedback on. We’ll use a subset of those questions for our example. 2. Under the “more” menu, select “Documents” to open up your Documents page. 5. Indicate specifics for that question. 6. 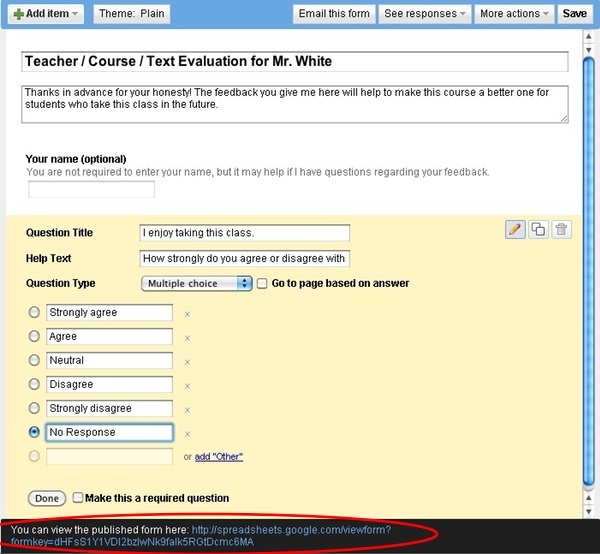 Add additional questions as desired by clicking on the Edit button. 7. Note that at the bottom of this Form editing page, a URL is given. This is the URL that you provide to students so that they can view the Form in a browser and begin entering information into it. Here’s the interesting part: this form is really just a “front end” to a spreadsheet that is automatically generated when you create the form. 8. 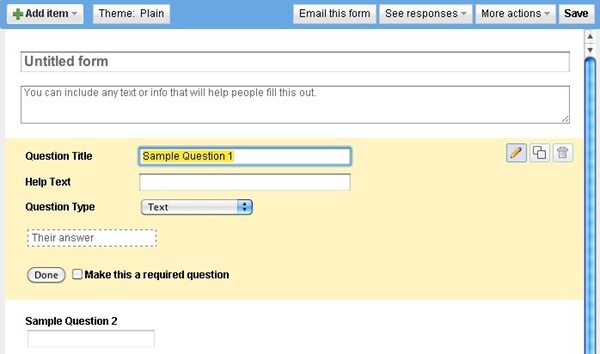 To see what your form looks like, and to test out the spreadsheet, go ahead and click on that link at the bottom of the form you’ve been editing. A new window will open up with the completed version of your form. I’m going to go ahead and fill out some test data. 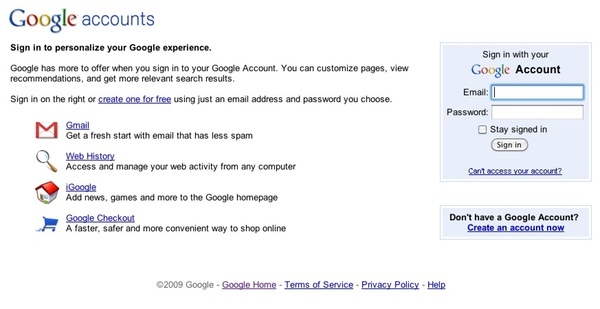 Once the form has been submitted, there’s a brief thank-you note from Google… and that’s it! The information has been entered onto my private spreadsheet. 9. 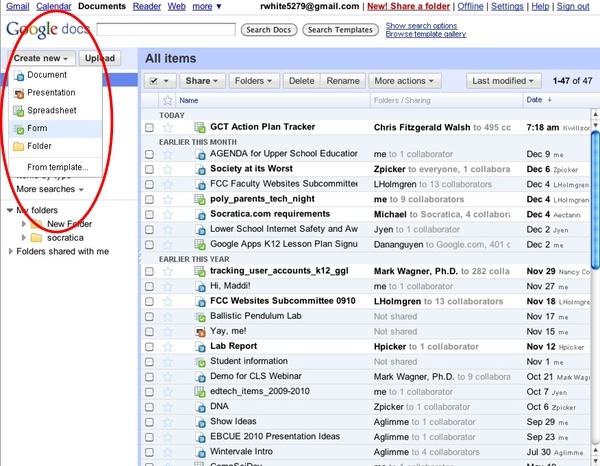 I can access that spreadsheet by looking at the documents listed on my Google Docs page (you may need to reload the page if it’s a new form that you’ve created). 10. Click on that spreadsheet to load it into a new window where you can view its contents. Here, you can indicate whether or not you’d like the sheet to be visible online (to anyone who has the link), and whether or not you want to give them the ability to edit the spreadsheet itself. 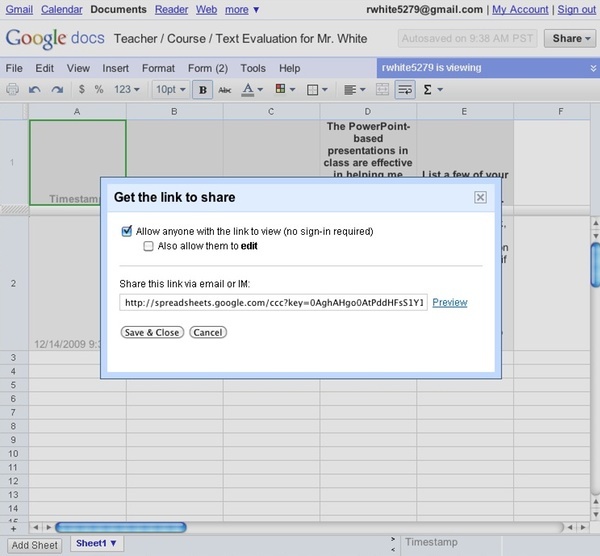 Teachers have found lots of ways to leverage Google Docs’ Spreadsheet app and the Forms front end that you can use to automatically fill out a spreadsheet. As of this post, you can see how some people have done this here, and here. Or how about this Self-Grading Quiz?